In the Kingdom of Bhutan hospitality permeates every sphere of social life, whether private or public; it infuses (religious) festivals, rituals, rites of passage from birth to death and all kinds of political and social gatherings. From the sharing of food and drinks, singing and dancing, to the exchange of gifts, goods and services, such all-encompassing traditions of hospitality are fundamental to enriching and fostering relationships, thuenlam, at every level of society. This makes them of great importance in nurturing community vitality, psychological well-being and culture, which are three of the nine domains of Gross National Happiness (GNH) the others being education, health, time use, good governance, ecological diversity and resilience, and living standards. GNH is, of course the unique Bhutanese development ideology which places as much emphasis upon happiness as it does upon economic well-being. Official hosting events and practices are based on the etiquette of driglam namzhag (‘system of ordered and cultural behaviour’) as formulated by Zhabdrung Ngawang Namgyal. 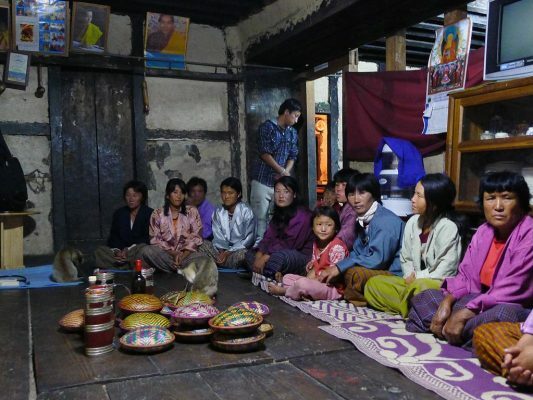 This article hopes to provide a tiny glimpse into everyday hospitality and hosting in communities and is based on ethnographic research, mostly confined to Bumthang in central Bhutan and Lhuntse in eastern Bhutan, with some examples from other parts of the country provided. The neypo (host) system, with its network of host and guest relationships, was identified in my ongoing doctoral research as the main way in which bonds between communities in different valleys in Bhutan were sustained. The neypo network once covered the entire country and even beyond its borders. Whenever villagers travelled to another valley they usually stayed with their host families – neypos. Since the early sixties the system has gradually dwindled due to increased socio-economic and infrastructure development. 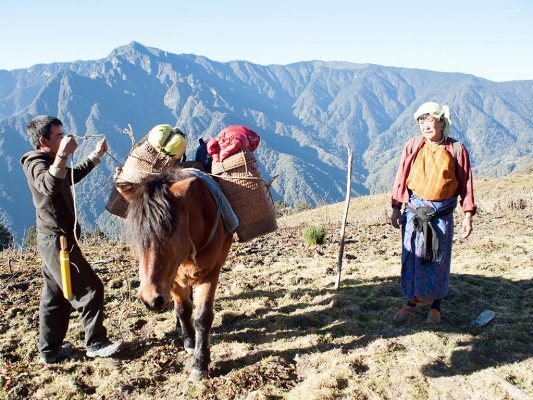 In more remote Eastern Bhutan the neypo system still exists, especially amongst the yak herders who have to descend from their high-elevation pastures to the lowlands every year in order to barter their butter and cheese with the rice, chilli and maize produced in the fields of their hosts. Between families, guest/host bonds were very cordial and relations were maintained over generations. The respective families regarded each other as relatives and in some cases they are still in contact even though the seasonal migrations have long been abandoned. At some point the host families themselves would travel and be hosted reciprocally in the homes of their previous guests. While the Dzongkha (national language) term for host is neypo, the Bumthap refer to it as ‘nadpo’, or ‘naspo’, depending on local accents. 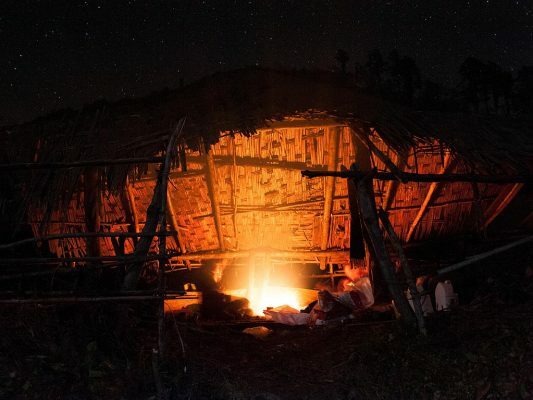 People from Pema Gatshel, on the other hand, used to have cross-border hosting connections with Assam, and referred to their hosts using the Assamese term ‘shazi’. However, the term neypo is commonly known and used throughout Bhutan. Seasonal migrations between higher and lower ecological zones were important activities in the rural subsistence economy in Bhutan. One agey (old man) in Lhuntse very graphically described that the neighbouring Bumthap flocked into his valley like a “swarm of bees” to barter, beg, trade and glean! The Bumthap also went to the neighbouring district of Trongsa, for sharecropping and barter. Seasonal migrations of Layaps and Lunaps from Gasa to the lowlands of Punakha, thasa, in the west of Bhutan, and of Merak- and Saktengpas to lowland areas of Tashigang dzongkhag in the east, are also examples of similar food gathering and exchange. In the past footpaths were well maintained through frequent use and some villagers referred to them as traditional ‘highways’, indicating that there was a lot of coming and going! Before embarking on a journey the astrologer, tsip, had to be consulted to identify an auspicious day, zakar, on which to begin the journey. Travellers had to be careful not to neglect beliefs relating to the local cosmologies of the sacred and spiritually inhabited landscapes through which they passed. 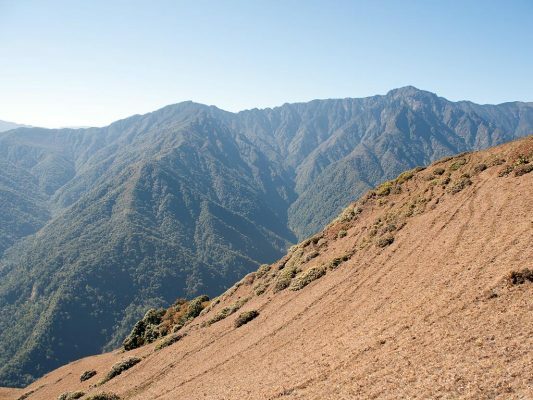 Engendering good relations with the entire spiritual ‘landowners’, referred to as neydag (spiritual landowners of holy, sacred places) and zhidag (general spiritual landowners of landscapes such as mountain passes) is still important. The idea being that if good relations are encouraged, these local deities and spirits will, in return, not harm travellers or their beasts of burden and may even create favourable conditions for the journey. Maintaining relations with the spirits and deities can be viewed as part of the wider hospitality framework, as there are certain rules and moral obligations governing behaviour when crossing through the territory of spiritual landowners who are regarded as the local hosts, neypos. For instance, when stopping for the night, travellers must obtain the permission of the local deity; usually this is achieved by an offering of sang (incense). 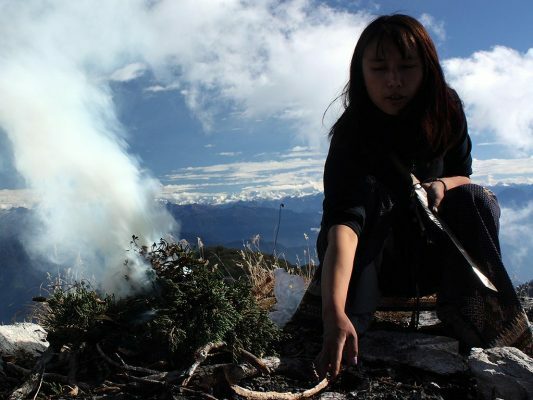 Some activities are considered taboo, such as burning ‘unclean’ items over an open fire, including meat and garlic, and nowadays modern pollutants such as the ubiquitous plastic. Doing so creates drib, impurities, which upset the local deities. Milk and curries that boil over and spill into the fire are also considered impure. If precautions against committing these transgressions are ignored or neglected, it is believed that harm can befall the travellers and their beasts of burden. When reaching a pass, a serkyem (an alcohol offering) will be proffered to the local deities who inhabit the area around the pass. At the same time the travellers might drink a cup of ara too, the local moonshine usually made from wheat or maize, followed by a mandatory re-fill called a dron. Thus a cup or two of ara not only appeases the local deities but helps the travellers on their way a little lighter of foot (and head). When the Bumthap reached their neypo’s house in Lhuntse, they received a cordial welcome as if they were a family member. The hosts helped the travellers unpack their horses and then escorted their guests inside. The sequence of beverages served would differ slightly depending on the region. Mostly ara would be offered first, then tea, ja, – if available butter tea, suja – and nowadays also sweet tea, ngaja, is offered. After snacks, lunch or dinner would be served. In between, the guests would offer their choom, a general gift one brings when visiting someone’s house. As the saying goes in Bumthangkha: ‘yag thongpa minla tsamtek’ (‘Just enough to make me not empty handed’). The term choom implies that the gift is for someone who is considered of equal status. 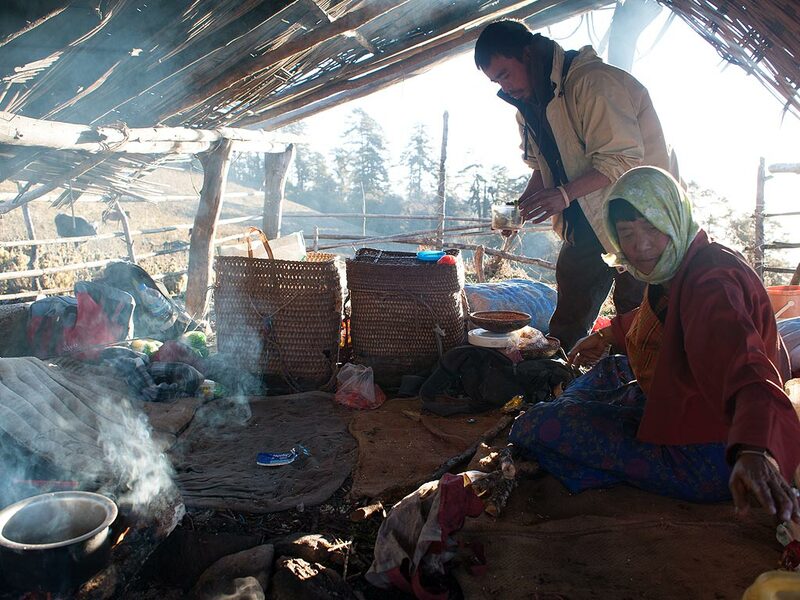 The Bumthap, when travelling to Lhuntse, would usually bring dried turnip leaves, loma, incense collected from the higher alpine regions, sangzey, fresh cheese, phrum or dried cheese, tedpa or tespa, and roasted barley flour, thru. After their extended trips to different villages in Lhuntse they would return to their homes with rice, chhum, maize, asham, chilli, bangala, dried fruits and sometimes yeast, phab. Ideally hosts should exhibit generosity and selflessness towards their guests. Guests of higher status are expected to reciprocate the hospitality received with a soelra (parting gift or tips from someone of higher status to someone who is considered to be of lower status), and then they will again receive a lamju from their hosts; a farewell gift for the journey, often alcohol and some food. 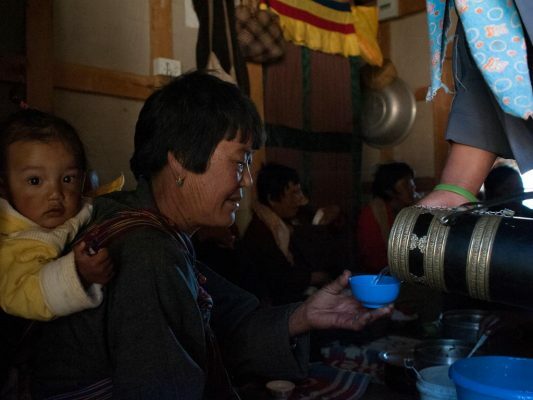 The people from Laya and Lunana still visit the lowland areas in Punakha in the winter, bringing yak products such as butter, cheese and meat, but also ropes and blankets made out of yak fur and wool, and sangzey for bartering for rice, chili and other cereals. Some of these are offered as gifts to their hosts who reciprocate by providing some grain and other produce of the lowlands, which are either offered as a chomlog (return gift among equals) or as lamju when the Layaps and Lunaps return to their home, or both. In Eastern Bhutan, tshogchang is a traditional welcome used by local communities to receive guests. A member from each household will come with some ara, snacks and eggs and gather where the guests are staying to hold an ‘ara session’ with them. The ara will be heated with egg and butter and then shared. Tshogchang sessions are often accompanied by joking and songs and dances, and often continue well into the night. When the tshogchang is over the guests should give some money as soelra to the members who organized and contributed to the tshogchang. The amount depends on the guests, but should be at least equivalent to the value of the offering. This is a brief account of traditional hospitality and travelling in Bhutan emphasizing how the neypo system provides a framework for sophisticated exchange. Through the neypo system Bhutanese villagers have become experts in hosting and entertaining guests. These rich traditions have been in place for centuries and although some of these practices are vanishing, many of them have evolved and adapted and continue to be of importance for Bhutanese social relations, thuenlam, and community cohesion. Understanding the importance of establishing and keeping good relations, thuenlam, through these customs in Bhutan is of tremendous benefit in developing sustainable rural tourism. Moreover so as such practices are integrated and rooted within the existing traditions. Ulrike Čokl is co-founder of Bhutan Homestay and Ph.D candidate at University College London (UCL), U.K., Department of Anthropology. She was affiliated in Bhutan with the College of Natural Resources (CNR) at the Royal University of Bhutan (RUB) from 2012-2015. 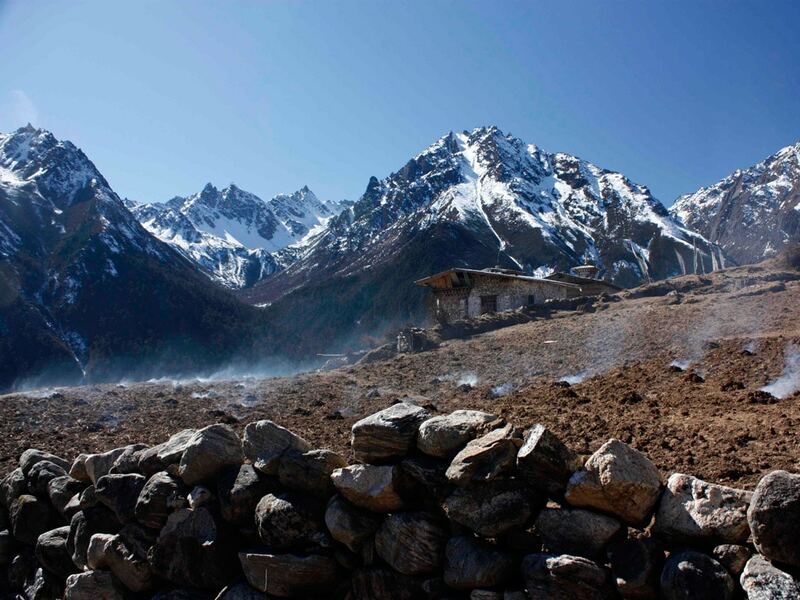 Ulrike has been living on and off in Bhutan for over 16 years.